With over 30 years as a piano technician, Stoney Copelin credits his experience as a lifelong pianist for the special awareness he brings to his piano technician work. Stoney prefers to play a piano before beginning work to pick up on issues that other technicians who don’t play may not recognize. 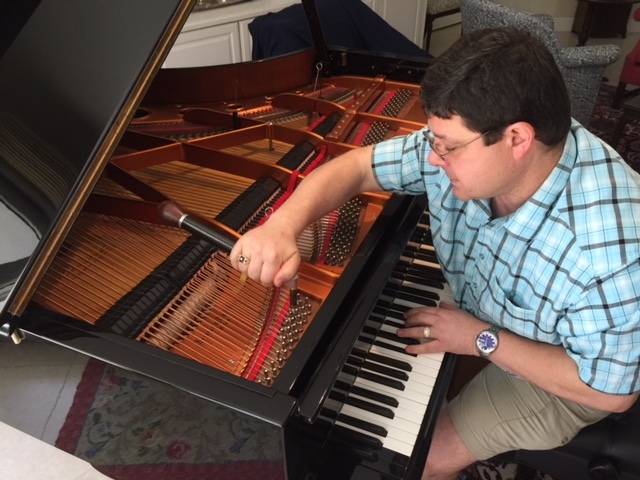 Stoney has served as the official piano technician for such organizations as the American Jazz Pianist Competition, the Young Musical Artist Association, and the Indian River Symphonic Association. He has tuned on concert stages at the University of Arkansas, Florida Institute of Technology, University of Colorado, Oberlin College, Gnessin School of Music, and Moscow Conservatory among others. Stoney studied under techs from some of the best piano manufacturers worldwide, including Steingraeber & Sohne, Feurich, Kawai, Baldwin, and Wilh. Steinberg. 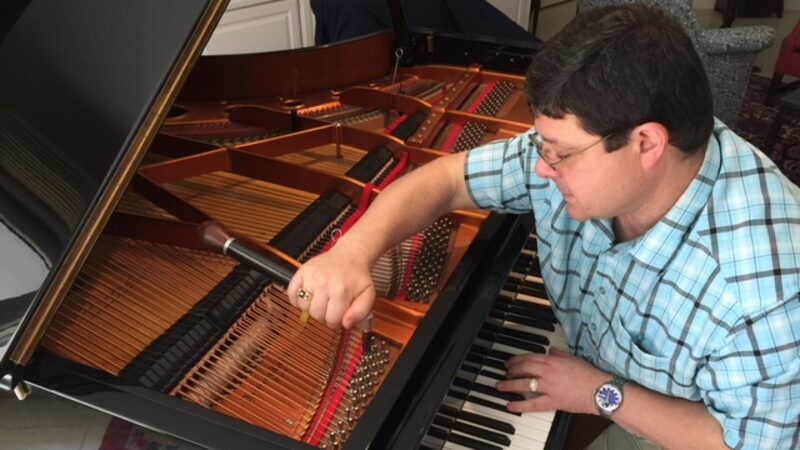 He is currently a master technician at Atlantic Music Center and operates his own personal tuning and piano technician business throughout all of Brevard and Indian River Counties. ear, as done by master craftsman for hundreds of years and to the current day. Stoney has gained many loyal customers due to his consistent, quality work. Tuning should be performed every 6 months, or at least once a year. Every piano and environment is unique and may require more or less upkeep. New pianos, or freshly re-strung pianos, will need at least 3 tunings the first year to settle the strings. Don’t trust just any movers with your instrument! Stoney recommends using Atlantic Music Center which offers professional piano moving services across Florida’s East Coast. Regulation refers to the process of adjusting the piano mechanism to achieve proper working condition. It includes proper lubrication. If your piano plays inconsistently, will not play properly softly, misses notes, hammers bobble on the strings, or seems to have a weak sound and lack of power it is likely in need of regulation work. Not all tuners have the experience necessary to properly regulate pianos! Pianos fall out of regulation often due to age as piano parts compact and wear over time. Sometimes atmospheric condition can also cause issues. If you suspect regulation issues with your piano give Stoney a call! Voicing refers to the process of literally giving a piano it’s voice. The tone quality (bright vs. mellow) can be adjusted through the voicing process and is a normal part of piano maintenance. Your piano may need voicing if it has a “nasally,” “tinny,” muffled, or dull sound. Voicing is subjective, and each pianist has different tastes and preferences. Stoney voices each piano for the client and to the room. Pianos occasionally need to be disassembled and cleaned. This procedure can be simple to complex depending on the results expected and condition of the instrument. Stoney is qualified to safely and thoroughly clean all parts of your piano. piano, such as the strings, pinblock, soundboard, hammers, action parts, and more. The average lifespan of most pianos is between 60 and 80 years. Piano hammers last between 30 and 50 years with average home use. Even if not worn out, piano hammers will lose their ability to rebound properly due to atmospheric exposure alone. Nothing lasts forever! An 80 year old grand piano, while sometimes still playable, is at the end of its lifespan and will need rebuilding in order to last an additional 80 years. Older instruments should be inspected by a qualified technician to determine overall condition, past work, and the best plan for improvement. With pianos, condition is more important than age! Stoney can rebuild and/or repair any part of your piano that is in need of attention. Whether purchasing new or used – from a store or private party – it is always advisable to have a technician inspect the piano being considered, just as you would have a car mechanic you trust inspect a car. Please contact Stoney to schedule an inspection before you purchase any piano. A good technician will save you much hassle! Atlantic Music Center offers a wide selection of quality, warrantied instruments to the local market. To save future expense it is often safer to purchase through a dealer such as Atlantic Music Center! Stoney performs for private and public parties and events playing and singing a mix of popular and jazz classics. I am often unable to receive calls while working. Please use the form below for a written response. Thank you!